Summer is well under way and hopefully your garden beds are all full. Some crops will have been harvested and the space is empty until you fill it again. If you worked out your garden plan and made a garden map back in the winter, you will have an easier time filling those spots. You should already have anticipated when each crop would be finished and what would go in next. The seeds would have been included in your seed order and are ready to plant. Not everyone is as up on their garden planning as they would like, and even if you do have a great plan, things have a way of changing. Some of you are new at gardening and are just now learning as you go. You need to consider what comes next in the succession of crops through your beds. Rarely do you plant at just one time and then weed and harvest for the rest of the season. Succession planting refers to planting one crop after another. It can be succession planting in one place, with a new crop going in when another is done. I grow cowpeas, often known as black-eyed peas, as our dried bean. Cowpeas prefer soil that has warmed to 65 degrees. I harvest wheat and rye for grain in mid-June, although this year much of the grain harvest has been early with the weather heating up so early. Mid-June is a great time for the cowpeas to go in. I make furrows in the dead grain stubble and plant the cowpea seeds. The stubble provides some shelter for the new seedlings and will gradually decompose to feed back the soil. 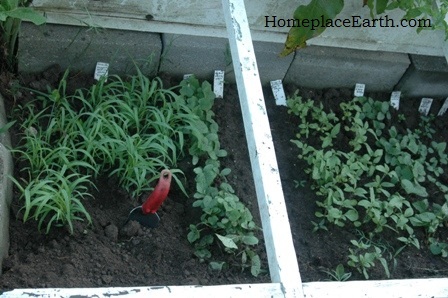 Besides the grain beds, other spaces that might open up for planting at this time are where your garlic, onions, lettuce, sugar snap peas, potatoes and cabbage family plants were growing. Succession planting could also refer to planting a certain crop at intervals so you have a continued harvest. In that case, the next planting is done in another bed while the first planting is still growing. The snap beans that I grow give me a good harvest for two weeks. If I want a continual harvest each week in the summer, I can plant them every two weeks somewhere in the garden. I did that when I was selling vegetables. Of course, if they are for your table that means you are snapping beans all summer. For home use, you might plant enough for a large harvest to preserve, then a smaller planting or two to eat fresh. I plan to have beans to can early in the summer, before the tomatoes come in. You should schedule things like this around your vacation plans or other times you know you will be busy. The forms in my video Develop a Sustainable Vegetable Garden Plan can help you calculate your plant and harvest times. Planting for a continual harvest of something like sweet corn is interesting. You could plant the same variety at two week intervals like with the snap beans. You could also extend your sweet corn harvest by planting early, middle, and late season varieties at the same time. They will mature one after the other. In this case you need to know the days to maturity for the varieties that you are planting. Corn will cross pollinate with other varieties and it will show up in the seeds that you will be eating and saving. If you want to keep the varieties separate, make sure there are at least two weeks from the maturation of one variety to the next. I plant Bloody Butcher corn for cornmeal and popcorn for fun. The Bloody Butcher goes in first because that is my main season crop. The popcorn is planted later. Things like summer squash or cucumbers can be planted at one month intervals. Those zucchini plants that looked so good when they were first coming along have a tendency to just die on you one day. That’s when it is nice to have that second or third planting as a backup. Even a few plants here and there, filling in spaces as they become available, help to keep the produce coming into the kitchen. For crops that succumb to the first frost, you can decide if you have enough time for it to mature by figuring the days to maturity plus the weeks of harvest. Add about two weeks because once the nights begin to cool down in September, maturity time is affected. Now you have the number of days you need before that first frost to allow for this crop. Using a calendar, count back that many days from the first expected frost in your area. You have up until then to plant the crop. If you don’t already know when to expect your first frost, ask around or call your county Cooperative Extension Service. You can use your coldframe through the summer, without the lid of course, as a space to grow seedlings to have ready when you need them for transplanting. Some crops, such as the cabbage family, are cold hardy and are tastier once they have been touched by frost. With a little protection, they can be harvested over the winter, depending on your climate. Eliot Coleman’s book Four Season Harvest has good information on that, plus a chart about planting times according to your frost date. Without added protection, however, you will need to bring that crop to maturity by that first frost date, even if the harvest continues long after. I plant carrots and beets in the summer so they will mature no later than mid-October. If I’ve planted enough, I can harvest all through the winter. The tops will die back and I’ll throw some leaves over the bed for protection once the voles have found other winter homes. It might be that you have space open that you intend to plant something in, but for one reason or another, there will be a delay. That is a great niche for buckwheat. It grows fast, filling the space and flowering in about 45 days, leaving no place for weeds to come in. Furthermore, those flowers attract many beneficial insects that prey on the annoying ones. 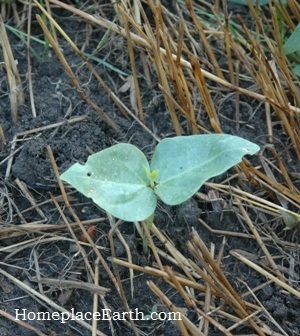 It is good to have buckwheat coming up somewhere around your garden all summer. 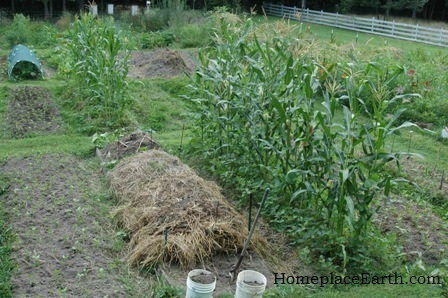 Having a tight rotation, with one crop following another, will do much to keep weeds from overtaking your garden beds. However, it happens to everyone, sometime, that the next crop is delayed and the weeds do move in. Consider them a compost crop and add them to your compost pile as you clean up for the next planting. Hopefully you take them out before they go to seed. Those weeds will add diversity to your compost and be a good reminder to you how helpful it is to follow a tight rotation. There is still plenty of summer left. Have a good time in your garden! Two years ago our daughter and son-in-law had a dream-come-true wedding. I’m sure many would not want to do something like this, but I think there are enough people out there who might be interested in hearing about it. I hope that by telling you what we did, it will get the creative juices flowing when you plan your own events. Betsy and Chris told us at Christmas that they wanted to be married in June. They were living in Arkansas and would be returning in May to settle near family. As the wedding plans began to take shape, we realized that this would be quite an adventure for all of us. 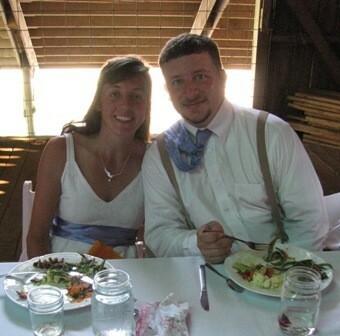 Betsy and Chris met when they both worked at Brookview Farm in 2004. At that time, in addition to the grass-fed beef they still sell, Brookview also had a market garden and pastured laying hens and sold compost. It was their dream to be married there, so they contacted the owners, Sandy and Rossie Fisher, who gave their blessing. Thank you so much Sandy and Rossie! When we started to think about food, we realized that probably no caterer would want to deal with us. I would contribute what I could grow and we wanted to source the rest locally. We have a friend whose unofficial specialty is hospitality, although it is playing the viola that pays her bills. Lucky for us the Richmond Symphony takes a summer break and Molly would be available. She gladly accepted the challenge, although she had never done something like this. Thank you Molly and crew Linda, Steve, and Jen! The wedding would be June 19. I got out a copy of the Plant/Harvest Schedule form and started to plan. That is one of the forms I explain in my DVD Develop a Sustainable Vegetable Garden Plan and a copy is on the resource page at www.HomeplaceEarth.com. The dates of the first frost and the dates of each of the weeks in the columns were filled in. I was going to be growing the green beans and lettuce. To have lettuce and beans on a specific day and not each week before and after is quite different than when I was a market gardener and had a continual harvest. I knew that the beans that I was planning on growing would be ready to pick in about 6 weeks and I would have a good harvest, picking every few days, for 2 weeks. I planted them 8 weeks before the wedding. If everything went as planned, I would have enough to feed our guests from the harvest of that second week. If something delayed the crop for as much as a week, I would still be okay. From my 10 years of growing lettuce for the markets, I knew that I could sow the seeds in a coldframe space and plant the seedlings into the garden in 3 weeks. In 5 weeks from transplanting I would be harvesting wonderful salad. In addition to beans and lettuce, I supplied the garlic, onions, and parsley. The bean harvest went as planned and we had plenty. As for the lettuce, I had planted enough, however some rabbits had gotten in and helped themselves and the weather had turned hot and dry early on. I provided what I could and we bought locally grown lettuce for the rest. Including the wedding party, we had 150 people respond that they would attend. Of course, there are always those who don’t reply in a timely manner, if at all, and we wanted to make sure we had plenty of food for anyone else who may be around the farm helping, so we planned food for 180. Plans for this wedding just seemed to flow together. Chris’s aunt and uncle planted potatoes for them. One of the best days Betsy and Chris had that week before the wedding was digging those potatoes that would become the potato salad for the wedding feast. Barbecue was a natural on the menu and Brookview Farm already had a place to cook it. The day of the wedding, Chris’s uncles cooked the pork raised by Brookview’s farm manager. Molly did a great job tracking down as many other ingredients as she could, including tomatoes and mushrooms for the bruschetta and cabbage, from local growers. She even got vinegar for the coleslaw from Virginia Vinegar Works. Chris’s cousin made the cake. The ceremony would take place in the pasture with the guests sitting on straw bales in the shade of fenceline trees and with their friend from Arkansas officiating. Thank you Jacob! Transportation for the wedding party to the field and for the bride and groom afterward was provided by Betsy’s brother, Luke, and his oxen. 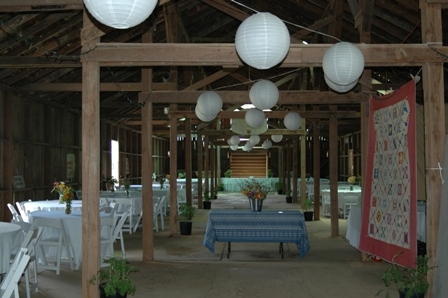 The reception was in that big old barn and that’s where we spent our time that last week. It had only been used as storage for many years. It was filled with equipment, old building supplies, remnants of hay, and some dried cowpies from when a steer got loose and ran around in there. Getting that steer under control was one of the early adventures Betsy and Chris had together at Brookview in 2004. We fixed the floor in a few places and we swept and swept and swept. Finally we let the dust settle and put up the rented tables and chairs and spread the rented tablecloths. In the classes I taught at the community college, I would talk about zero-waste events. In fact, that was one of the topics that my students could choose to write about for one of their papers. We needed to try to make this a zero-waste wedding. It wasn’t exactly zero-waste, but close to it. In the end Molly only had one bag of trash and I don’t think that was totally full. We rented the plates but found that it was cheaper to buy stainless steel silverware online than it was to rent it. We now have plenty for future events and it has already served another wedding. We used half-pint jelly jars for wine glasses and punch cups and pint canning jars for beer mugs and water glasses. People had been giving me their old canning jars for years, so we only had to buy a few dozen jelly jars. Betsy had brought Arkansas wine with them when they moved back and we got a keg of beer from Legend Brewing Company in Richmond. We used small flowered women’s cotton handkerchiefs for the hors d’oeuvres, taking the place of both a napkin and a plate. For dinner napkins, we used men’s work handkerchiefs in many different colors. I have to admit, it was a chore washing and ironing all those handkerchiefs ahead of time. But I only had to do it once. Both napkins (handkerchiefs) were favors for the guests to take home. Food packaging was kept to a minimum, and we traded containers back and forth with the homegrown produce. Food waste was deposited in the Brookview compost bin that Betsy built when she worked there. And then there were the flowers. We only had a few here to contribute but Betsy assured us she had it under control. She knew what was blooming in every ditch around and in her friend’s yards. In August she would begin teaching the classes I had just left at J. Sargeant Reynolds Community College and she was given permission to do some picking in the gardens there by the floral design instructor. Thanks David! 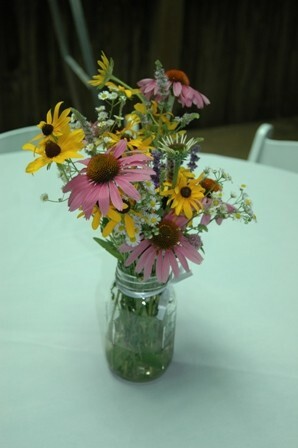 The morning of the wedding, she gathered the flowers from hither and yon and her friends, many of whom had just arrived from Arkansas, made the bouquets and centerpieces. Quart canning jars were the centerpiece vases. There were some places in the barn that were off limits and some things that just needed covering. 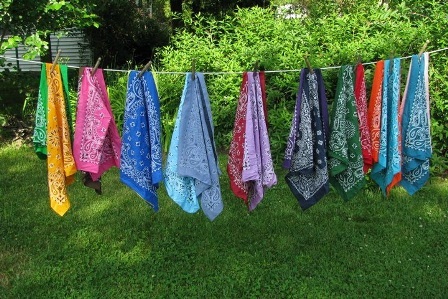 I called in every quilt I had ever made for our kids and took any from our house and we hung them up on clothesline or draped them places. Betsy and I restyled my cotton wedding dress that I had made in 1972 and added a sash made from satin from her grandmother’s wedding dress. She dyed the sash blue to match the ties the guys wore. Chris’s mom, with help from her mother and sisters, made his linen suit. Only a few hours till the wedding! Casey Smith, a friend of Betsy’s from high school, was the photographer. We needed a DJ, so a month before the wedding my husband and I (Betsy and Chris were still in Arkansas) went to a local bridal event that apparently is put on each month and found one who had that weekend open because of a cancellation. Rick Ripley did a great job for us. I guess that cancellation was meant to be. You may not be planning a wedding, but I’m sure there is some event in the future you will be putting together. After all, birthdays and anniversaries come every year, as well as other occasions for celebrations. You might not have a stash of canning jars, or a friend with a barn, but you have other resources and connections. Start collecting dishes, silverware, and other things so you can avoid disposables. When you put your mind to it, I’m sure you can come up with a party that is unique to you and easy on the earth. To Betsy and Chris—Happy Anniversary! To the rest of you—have fun putting together your own special event.